We arrived in Paris at night just after it rained. We took a cab to our apartment in the 9th arrondissement. The cab driver played odd french dance music I can still hear in my mind. That was the soundtrack I first saw the Eiffel tower to. It seemed strange to see it by accident, seemingly out of nowhere from the freeway. This was a place I had always heard, seen from movies, and read flowery stories about, but never imagine really being there. But there we were, thrown into the Parisian night, finding our way with a little bit of French and our international debit cards. Our apartment was.. incredible. I spent months on Air BNB searching with high criteria; It had to have a kitchen, be in a great area, have a bathroom with shower, and most importantly have a balcony. I found an apartment that had two. TWO BALCONIES WITH A VIEW OF THE EIFFEL TOWER. It was a total dream. 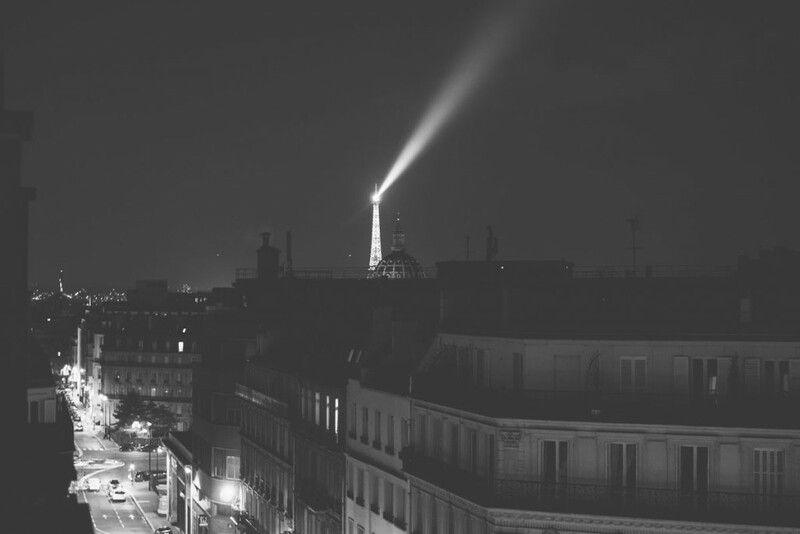 I spent many nights out there drinking wine, starring at the Eiffel tower, feeling the winter wind through my hair. I also spent mornings smelling freshly baked bread and reveling in the rare European, winter sunshine. It was the perfect setting for our time there. The night we arrived we walked in the rain to a cafe at 1am where I hate my first crepe ever. We didn’t feel tired. We felt alive with the neon night of new adventure. Our first full day in Paris was Valentines Day. We took the lions gate entrance into The Louvre to avoid the already massive line into the museum. Having studied art history I was in art heaven. There were so many pieces I had written about and studied closely through print that suddenly hung, framed right in front of my eyes. I could see the colors and textures how they were meant to be seen. 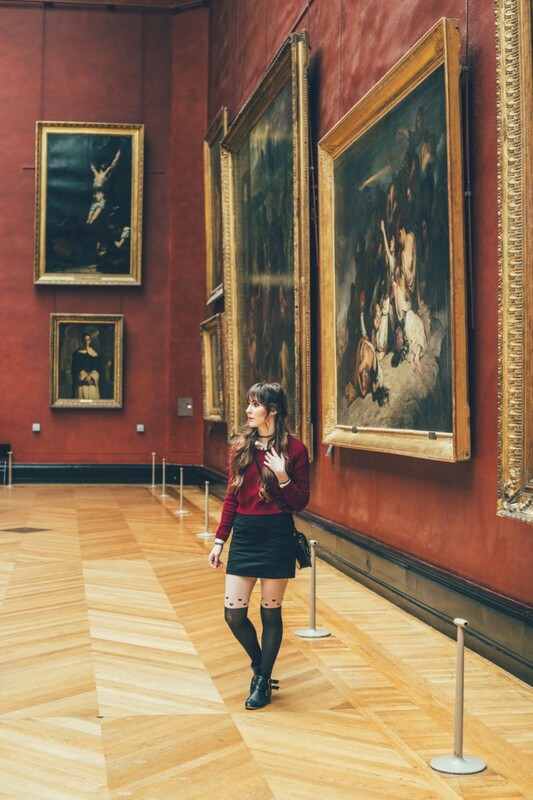 I could stand in front of those paintings feeling the scale of majesty at which they were meant to be felt. The Louvre is massive, but I was determined to see as much as possible. We hiked around the exhibits viewing thousands of years of art. Yes, we did see the Mona Lisa as well. It made me a little sad though. All those mindless viewers huddling around the Da Vinci, just to take a selfie with it and then leave immediately. Hardly of of them waiting to really look at her. 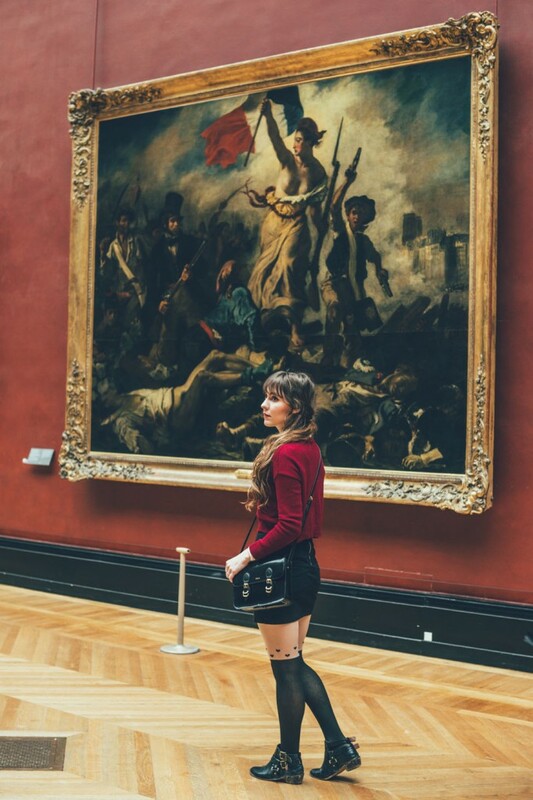 To actually see the “most famous painting in the world”. They just wanted a photo and the instant gratification of getting to say they saw it. I grew a new appreciation for the Mona Lisa, I had no interest in seeing her but decided to stand and analyze the image for a few minutes. I sill maintain the belief that the most interesting part of the painting is the depth and light deep in the background. It’s really beautiful. Soon the rain gave way and the sun appeared outside just as left made our way to the Seine River, Lovelock Bridge, and the Notre Dame. Paris was incredible but we did have some hard times. Jet lag must have caught up with us because we woke up one day at 1pm. That same day I also fell down the stairs of the Metro and injured my ankle. I couldn’t walk on it for awhile and had to limp all the way to the Champs Eylsees and then home. In Paris, you can power through the pain just to see the sights. One of my favorite days was spent at Disneyland Paris. Peter and I are huge Disneyland lovers and new right away we wanted to buy tickets (which are supremely cheaper than Disneyland in California) It was different there for sure. The whole park was smaller and less busy, but really fun! We hardly waited in any lines and laughed a lot of the whole day. It was pretty damn cold but Pete held onto me. The food and the people in France are wonderful. Everyone was so nice and helpful, despite what other travelers might say. And I could eat french food all day, everyday. It would mostly be dessert but still..
Montmartre was a just a nice stroll uphill from our place on our last day. We saw the homes and studios of famous 19th century artists and walked the streets they would have set their one steps upon. We lit a candle at the Basilique du Sacré-Coeur to have a safe and happy trip. It’s an enchanting experience to light your wish off of the flame of someone else’s wish. The light just keeps passing from hope to hope.